Scientists can reasonably be expected to understand the tools of their profession. In the case of cosmologists, this includes telescopes, gravity detectors, clocks and computers, among other things. While a good understanding of pure mathematics may be helpful, a thorough grasp of those parts of applied mathematics that are relevant to their discipline is essential. For cosmologists, this includes Einstein’s Theory of General Relativity. 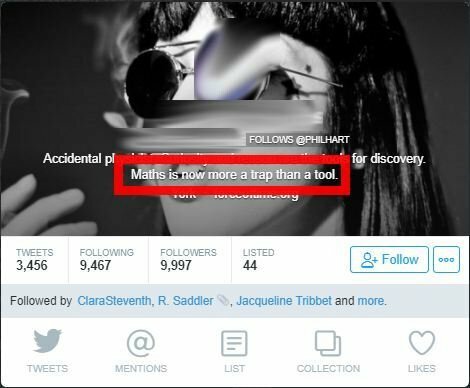 This post has been prompted by a self-declared accidental physicist whose biography on Twitter states “Maths is now more a trap than a tool.”. That statement could be disastrous for anybody who is less than fully secure in their own numeracy. For reasons of probity, I have suppressed the identity of the individual concerned. I refer to him as “W”. Mathematics is often divided into pure mathematics and applied mathematics, and this is done for very practical reasons. Pure mathematics can be regarded as a set of axioms, a set of rules of inference, and a set of theorems that can be derived therefrom. Applied mathematics can be regarded as the application of selected theorems so solve everyday problems, such as planning a journey or adding up the cost of all your purchases in a shop. The image below captures the entire conversation between W and myself. I have numbered the key points in that conversation, and I offer below my observations on those points. The “If” in the image appears to be a typographical error. The words “It constrains reasoned argument” immediately reveal a lack of understanding of the rules of inference that are used in pure mathematics. Pure mathematics simply does not apply to quantum theory. Quantum theory is a mathematical model used in physics – it is an example of applied mathematics. This sets a debating position which he overturns in point 4. The words “Maths cannot” voids the debating position that he set. This shows a lack of understanding of the concept of ordering in pure mathematics, which is itself built on the concept of one type of relationship between two members of a set. I then used the concept of spaces and basis vectors to frame my next question to him. This shows a lack of understanding of spaces and basis vectors, and a conflation of such spaces with space in cosmology. To assert that space is Einstein’s space time shows a lack of understanding of Einstein’s Theory of General Relativity. This conflates pure and applied mathematics. We appear to have an epistemological issue here. While the assertion that maths is now more of a trap than a tool might hamper W’s own work, the social damage this might cause if passed on to other people cannot be ignored. Educators in particular might need to be aware that students might be exposed to this sort of thing.